How often would you think it happens that all guesthouses in a sleepy little village in the middle of Germany are booked and heavy equipment is unloaded from a tourbus? 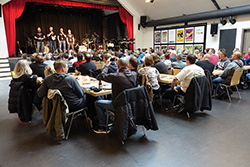 A small village becomes Germany's capital for fans of real legends of rock. 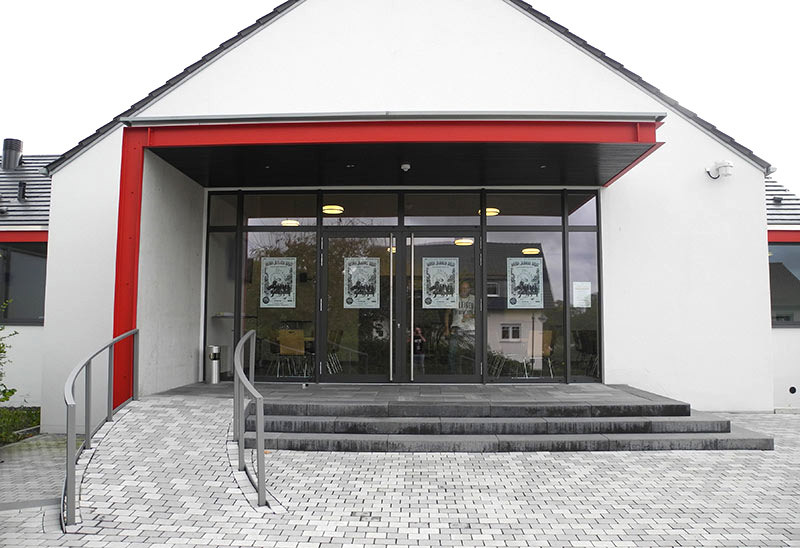 The German Genesis Fanclub it, founded in 1991, invited to celebrate its silver jubilee in the newly-built community centre of Eichenzell-Welkers near Fulda, Germany. Yes, your calculation is correct. In accordance to the practice of the Genesis camp the jubilee is celebrated with a slight delay. Nobody really complains, though, for people who have been members of the fanclub for up to a quarter of a century, have learnt to take it easy. In the programme brochure for the silver jubilee the fanclub looks back at how it changed over the years and offers a glimpse at what is planned for the event. The motto for the day was “…from Invisible Touch to it”. 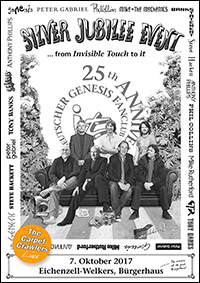 In its infancy during the early 1990s the fanclub was called Invisible Touch and provided up-to-date information about the world of Genesis to its members by means of photocopied fanzines. These soon gave way to professional printed magazines, the name was shortened to it (doubling as a reference to the Lamb song and the abbreviation of the 1986 Genesis album), and the fanclub began to organize conventions. None of this has taken away anything from the meaning and the attraction of the fanclub conventions that are not only labelled but have really become “events”. 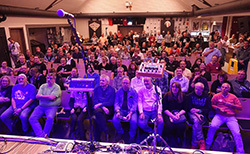 Over the years the fanclub staff have managed to lure people like the band's photo chronicler Armando Gallo or band members such as Ray Wilson, Steve Hackett and Anthony Phillips to their events. 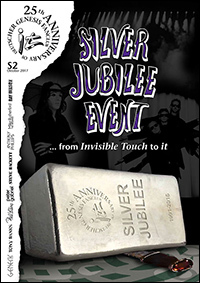 For their jubilee event they got the British Genesis tribute band The Carpet Crawlers to stop over in Welkers on their Invisible Touch tour. For the faithful reconstruction of the light effects from the 1986/7 concerts the musicians secured the help of a most competent hand. 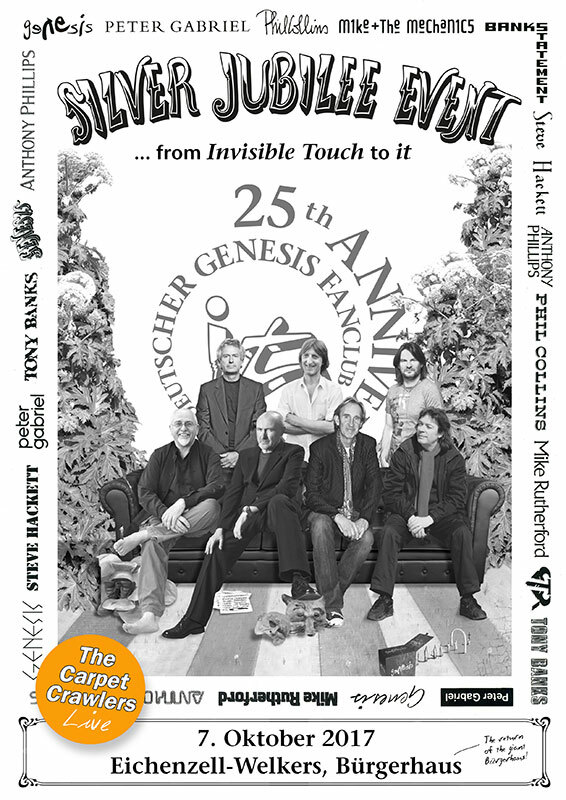 Mike Kidson, Genesis tour manager on the Invisible Touch tour, helped to adapt the stage show for smaller stages using up-to-date technology. He was scheduled to tell everybody at the event about his job at the tour. Unfortunately, family events prevented him from attending in person. Kidson recorded a video message in which he apologizes and talks about the capabilities of the spots that The Carpet Crawlers were to use that night. 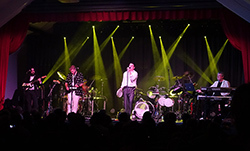 Genesis pioneered the use of movable stagelights (Vari*Lites) that can change colour in the 1980s. The gap is filled with a special treat. 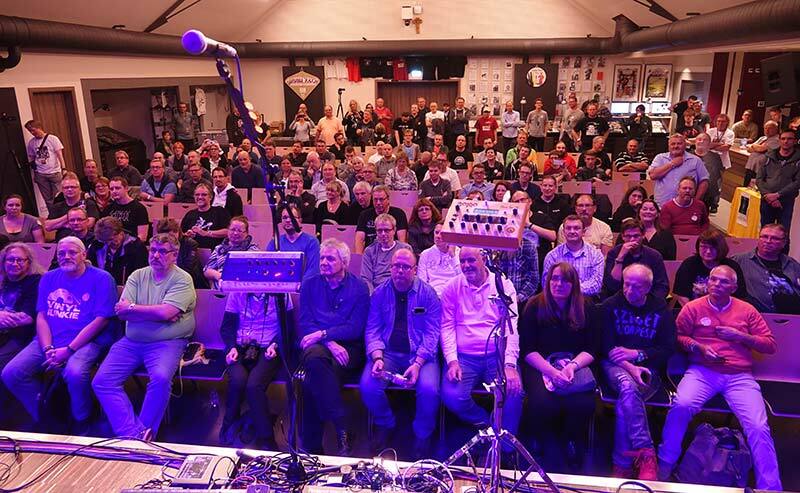 A professional film recording of a 1987 Genesis performance from the Niedersachsenstadion in Hannover has made it into the hands of the staff. 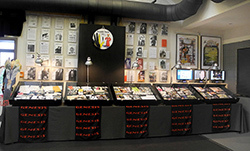 Avid collectors listen up and lo and behold! This is an excellent version of In The Cage, which has been available in good quality as a radio broadcast – but only as an out-of-focus and very shaky audience video (luckily, nobody does that anymore!). The official Live At Wembley Stadium DVD does not have this track due to gaps in the original tapes. The event then proceeds to an auction where special items from the fanclub history are auctioned off for charity, and a raffle. 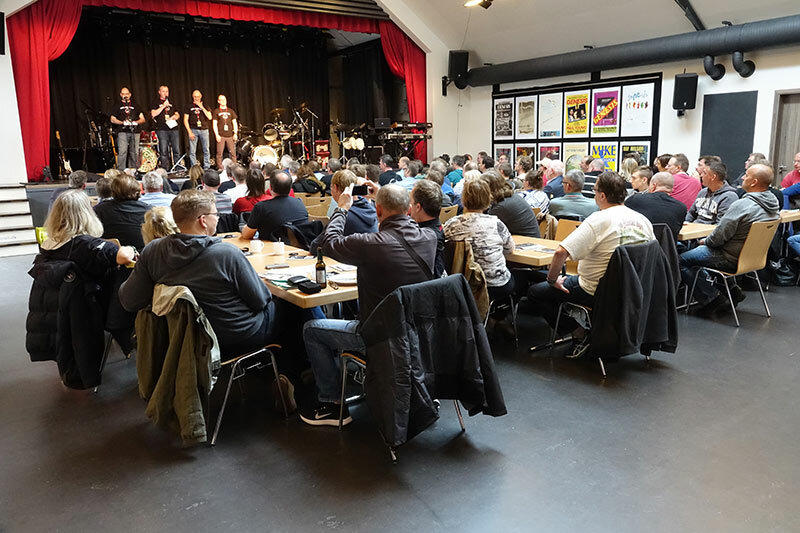 Oliver Düvel once more assumes his role as the quiz master of Rudi's Quiz, in which seasoned Genesis nerds can win attractive prizes for their in-depth knowledge. The breaks are the secret highlights of all the fanclub events. They provide time in which fans can talk with each other face to face without the internet. Many people have known each other for years, they do not talk about music only anymore, friendships have developed. Some have married each other and/or bring their offspring. 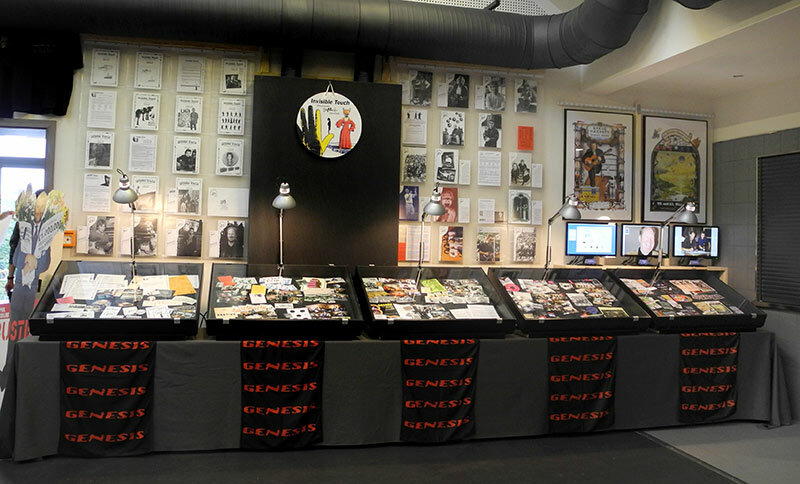 People also take time to examine the carefully arranged displays with keepsakes and very special items that showcase 25 years of fanclub history in which the fanclub has covered so many different eras from 50 years of Genesis and their solo projects. Obviously everybody also has the opportunity to fortify themselves with coffee, cakes, simple warm meals and cold beverages. 7pm is showtime for The Carpet Crawlers. 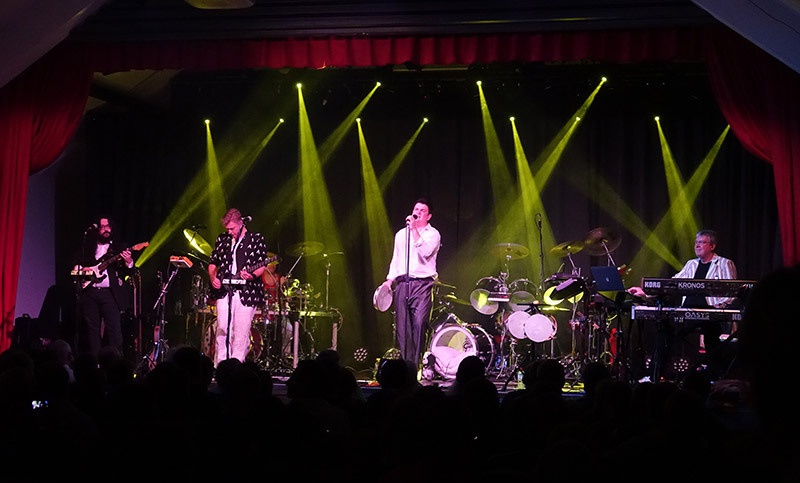 In period outfits from the 1980s they enter the stage to the drum machine sounds of Mama to play a typical set from the Invisible Touch tour. Singer Brian Cummings hotfoots to his drum kit during the longer instrumental parts to fulfil the role of Phil Collins who was very keen on reverting to his original job in concert. The band are, Cummins explains, very conscious of the fact that a fanclub is the most demanding audience. And this is why the band go all-out. They slip in Follow You Follow Me as an encore in mid-set, and the popular In The Cage medley moves not into the usual instrumental In That Quiet Earth but into the climax of the Genesis monolith Supper's Ready. Genesis themselves had to revert to Afterglow for the medley due to the strain on Collins' vocal cords (Collins' autobiography is quite candid on the bill Collins' health had to pay for the long Genesis tours). The Carpet Crawlers receive standing ovations. Brian Cummings stays modest: People who attend their shows are not primarily fans of The Carpet Crawlers but of Genesis – just like the band members. Another link between the musicians and their audience. Songs such as Invisible Touch and Land Of Confusion that were current hits in 1986/87 have now become, in Collins' words, “old old songs”. One may feel some envy for the band's new guitarist Daniel Saleh when Cummings points out that he does not have a fan background and has only recently discovered many classic Genesis songs. This probably includes Los Endos, which sits at the end of the regular set and receives standing ovations. The band up the ante for the encore: Dodo, Behind The Lines, Duchess and Turn It On Again (without the medley from Motown and rock 'n roll hits) turn the encore into a miniature version of Three Sides Live. For the last piece the band span a musical arc to the event motto “from Invisible Touch to it”. As in 1976, the Lamb closer it segues into Watcher Of The Skies. The Carpet Crawlers are visibly moved when they leave their enthusiastic audience. 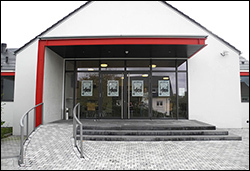 The Welkers community centre has survived the powerful sound and light technology. The fire protection officers from the local voluntary fire brigade are contented. The fans agree: it is good to be back. And they hope it is here to stay.